I had to make a few modifications. I used a 1-Tablespoon cookie scoop and it looks like she used a 3-Tablespoon cookie scoop. I also didn't add sprinkles, but that would be a great way to cover up any chocolate imperfections. 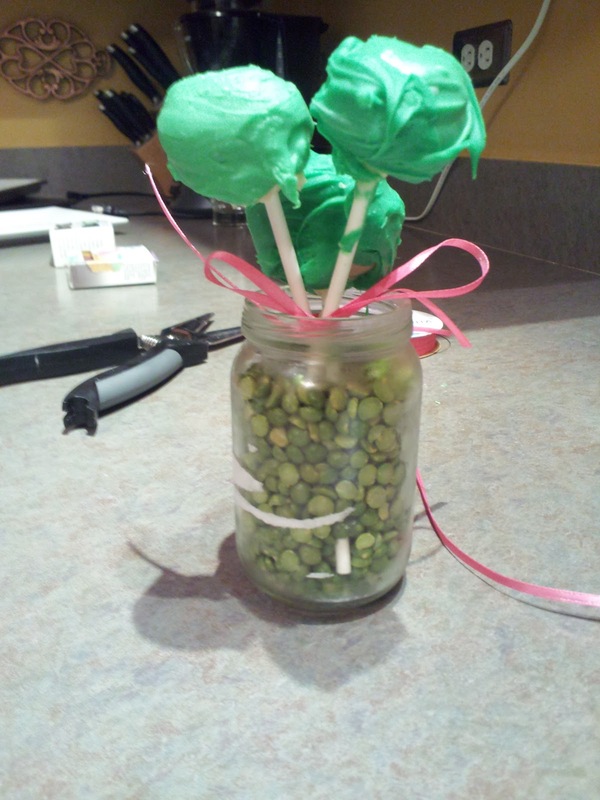 For Becca's Pea in the Pod-themed shower, I used green candy dye and white chocolate to make the outside coating. I also had to add about a teaspoon of oil to make the chocolate a littl easier to work with. I filled large baby food jars with split peas to hold the cake pops. The finished product was pretty cute and definitely tasty. Training Tuesday: Fort2Base or Bust!